Jordi Teixidó hails from Catalonia, which in the twelfth and thirteenth centuries became a maritime power in the Mediterranean extending it’s reach from the northeastern corner of the Iberian peninsula to Sardinia, Sicily and Athens. Though absorbed into Spain, the Catalans will vote on independence later this year, and possibly begin a reconquest of Greece. It’s there for the taking. 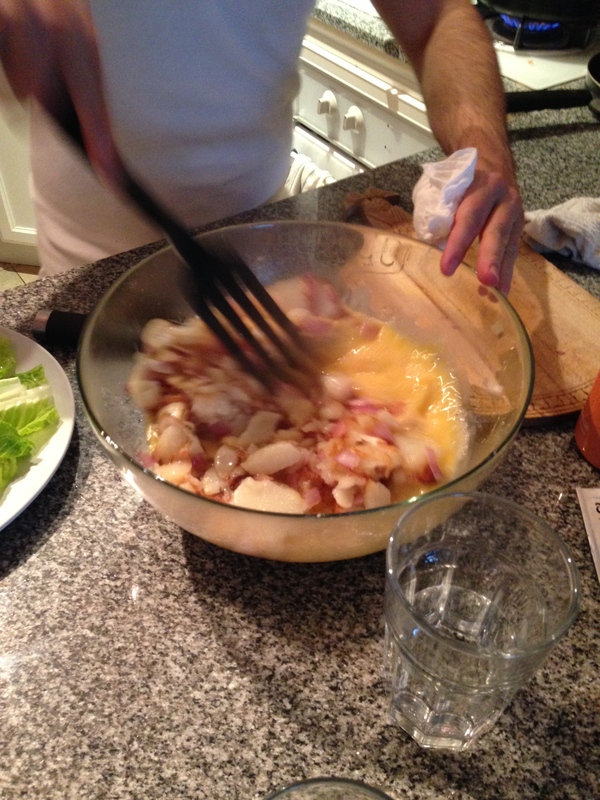 Meanwhile, it’s evening and Jordi’s going to show me how to make a Spanish Omelette or Tortilla de Patatas. 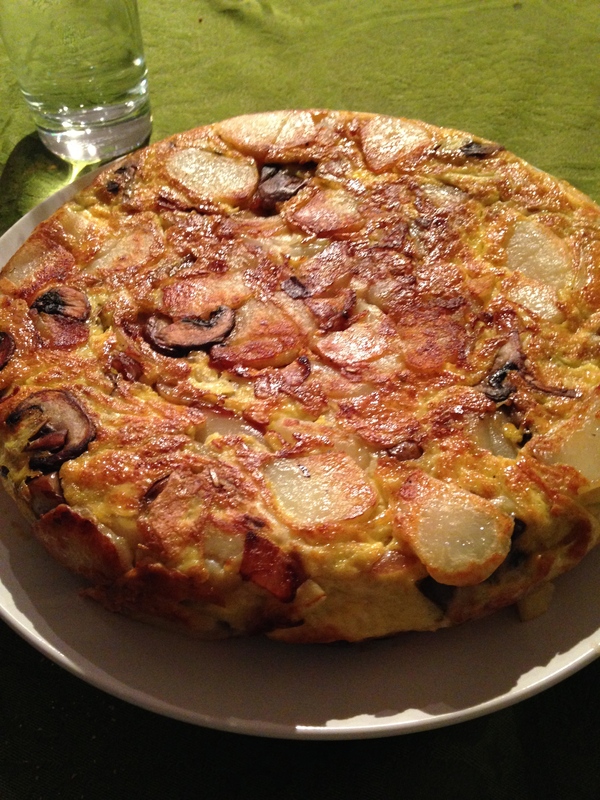 The omelette appears to owe allegiance to Navarre, which borders the Basque Country, specifically the city of Pamplona famous for it’s artichokes and ham, running of the bulls, and Sancho III the Great who apparently made a King Lear-like mistake, except with his sons rather than daughters. Don’t think I have these facts in my head, I’m walking the Borgesian-labyrinth of the internet to see if I can discover the secrets of the universe by pursuing one food through all is meta-manifestations. What seems clear is that this is hearty food for those who live off the land. Above is a seventeenth-century map of Catalonia, as you can see bordered by Valencia, Aragon and Languedoc. 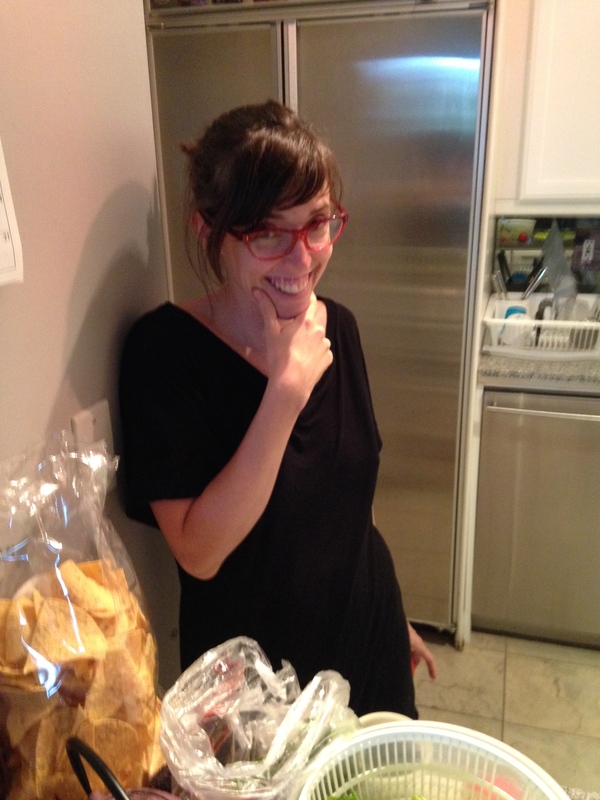 The only ingredients Jordi works with tonight are sunflower oil, potatoes, onions, and eggs. We peel the potatoes, then pare them into medium-thick wedges. The skinned spuds are tossed until all turn golden brown. 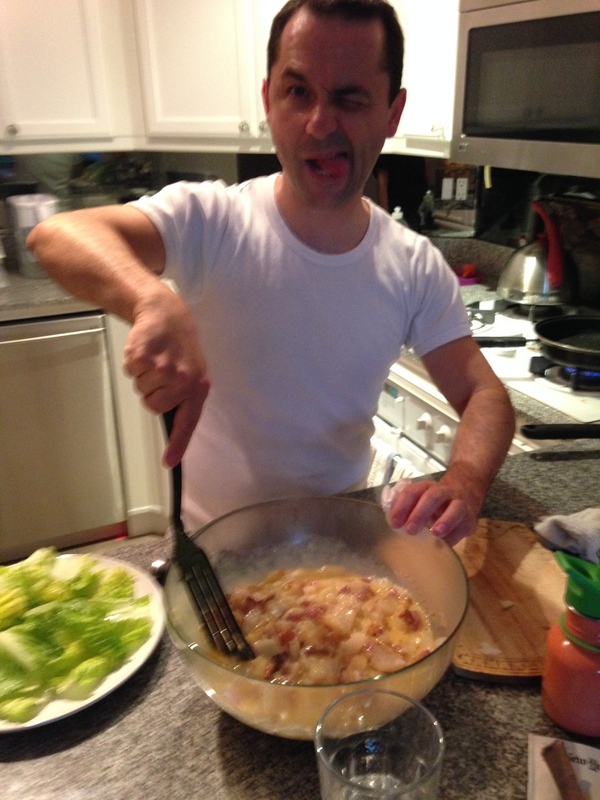 Then the onions are added. Now it’s time to beat some eggs. 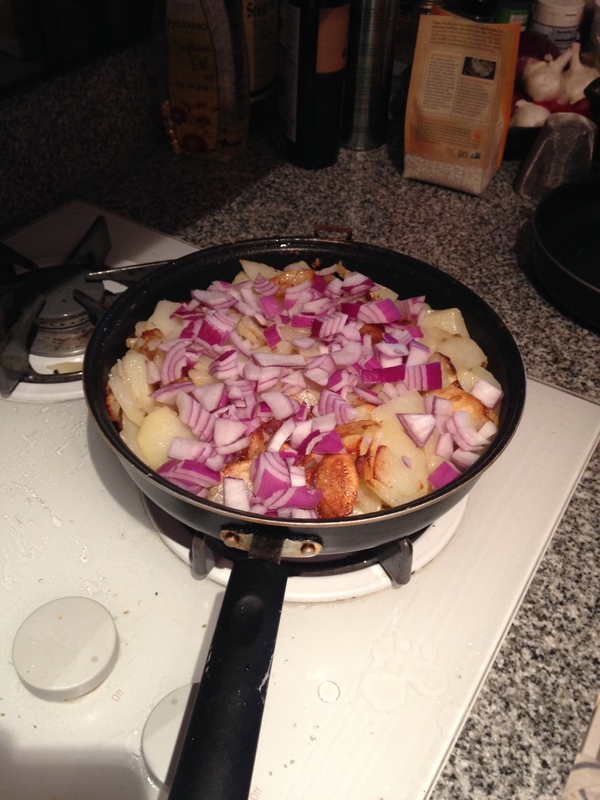 Throw in the sautéed potatoes and onions. 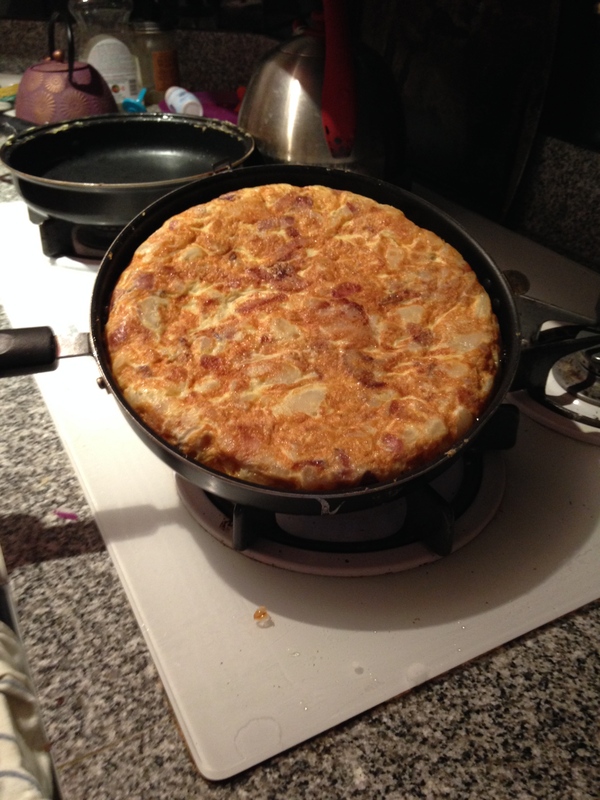 Stirring with comedy, levity appears to be one of the key techniques in making the spanish omelette. For those wondering if I’ve temporarily left the bone theme, I have not. As stated earlier, I consider egg and shrimp shells siblings to bones. Humans have been eating eggs since the Stone Age, so we can include them in our Paleolithic menu along with bone marrow. And yes, up ahead I will recreate a Paleolithic cuisine for mageírema ánthro̱pos. 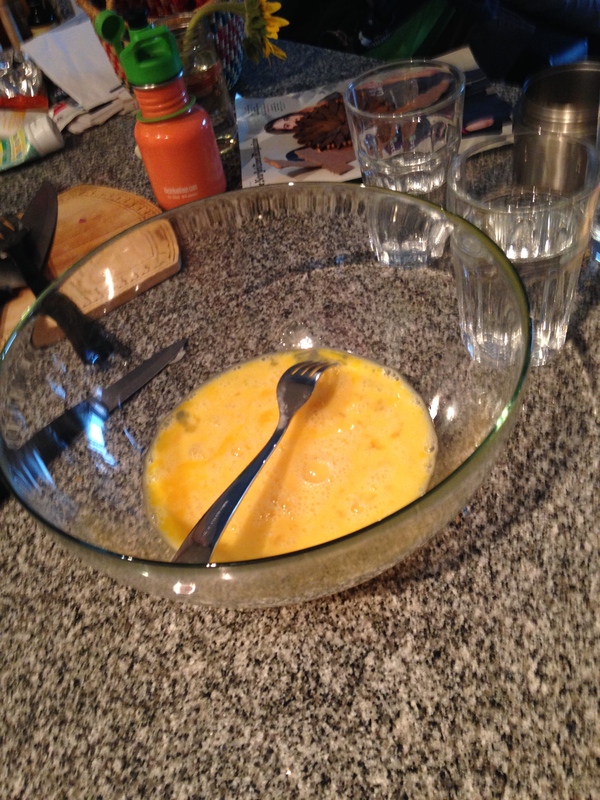 And the eggs and potato mixture go back into the pan. 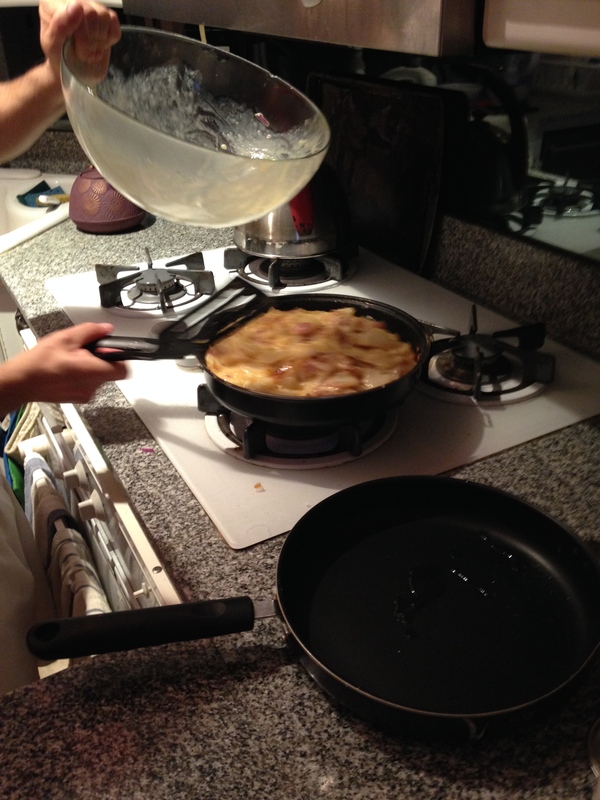 Now the trick with the Spanish Omelette is flipping it with all flying apart. Jordi uses a pan or a plate to accomplish this “harder than it looks” step. Here’s the flipped omelette. Beautiful. The chef is pleased. I’m beginning to think we should create a Cooking with a Catalan show through which we can preach the benefits of a resurgent Catalan empire. Doesn’t everyone look happy? Isn’t everyone well-fed? Join us. We pair the omelette with a couple local, organic wines from Jimbo’s: Frey and Girasole–chardonnay and pinot blanc. Refreshing, light and full of citrus. 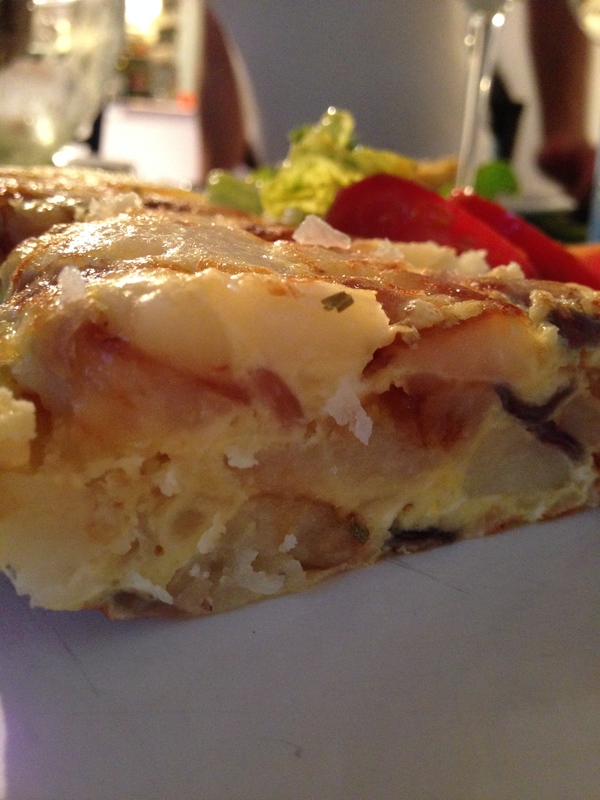 As you can see the Spanish Omelette has layers, much like a quiche. Delicious. Now I know what to make after a late-night of drinking and I need to absorb some of the sacred water as i sip a little more. 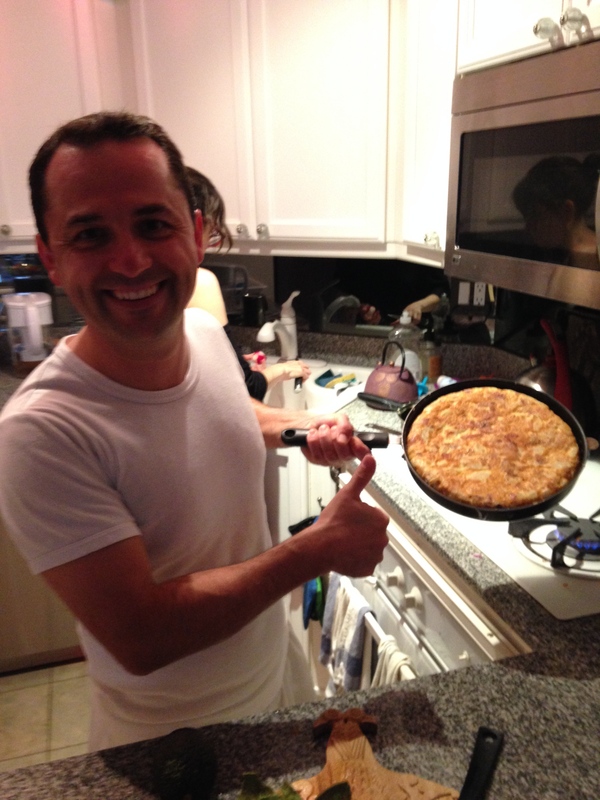 Here’s a shot from another spanish omelet Jordi made two nights later. A wheel of love.